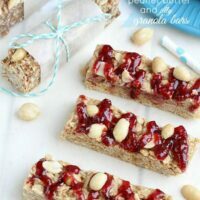 Soft and chewy no-bake granola bars that combine the classic flavors of peanut butter and strawberry jelly with crunchy peanuts. Happy New Year friends, it’s Kelly from Life Made Sweeter back again! Hope you all enjoyed the holidays! Did you indulge in lots of sweets? Even though it was very tempting, I managed to sneak in only a few treats despite all the chocolate I was around. Since most people are trying to make healthier food choices once January hits, I wanted to share one of my favorite lighter snacks I turn to once that sugar craving hits. 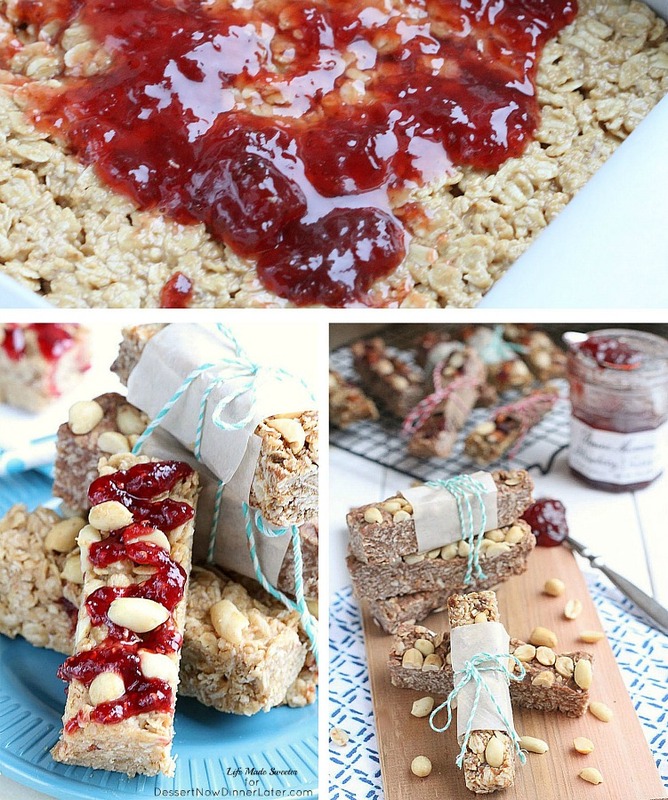 These Chewy No-Bake Peanut Butter and Jelly Granola Bars are super easy to whip up and contain no butter. 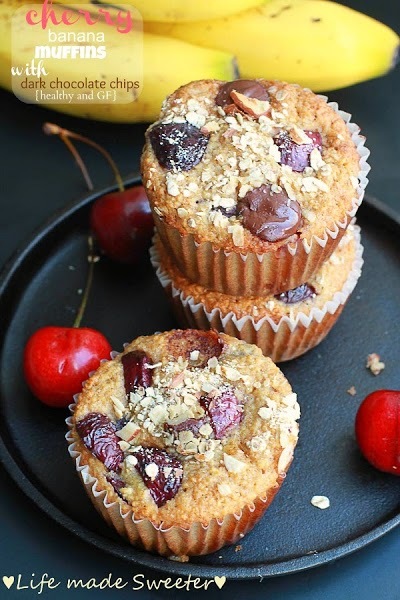 We use coconut oil, honey and peanut butter along with rolled oats, quick oats and oat flour. 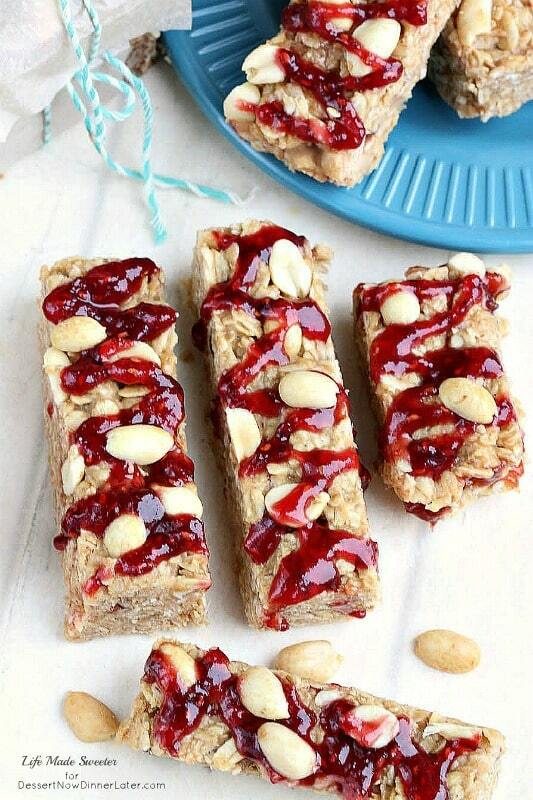 You get all your favorite flavors of the classic PB & J in a soft, chewy granola bar with crunchy peanuts. The flaxseeds add a healthy dose of fiber, but are also completely optional. 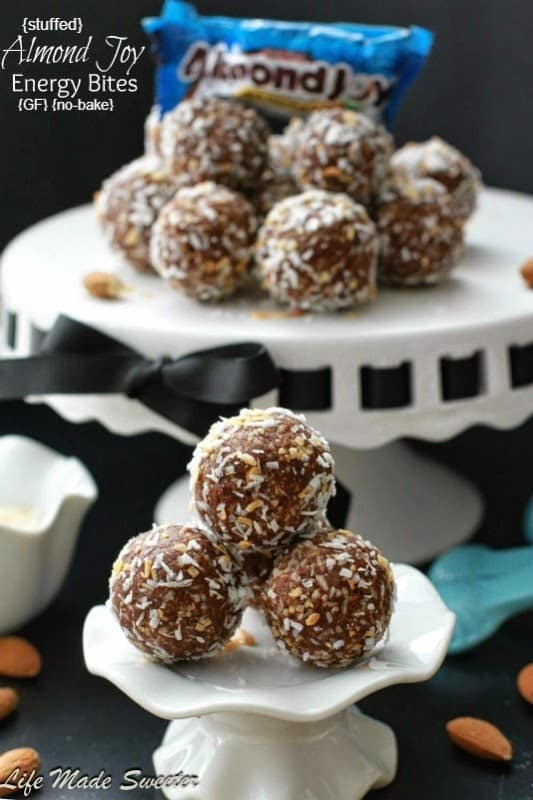 These are great snacks to make ahead of time for the week. They’re best straight from the fridge as they tend to soften up at room temperature — keep them chilled and grab one when you’re hungry or wrap them up and pack them into your lunch cooler so you can enjoy a healthy and satisfying snack when you’re on the go! They have an intense peanut butter and jelly flavor, so just be sure to use your favorite brands. You can even leave out the strawberry jelly filling if you’re not a fan or use your favorite nut butter that you like instead. I make different variations of these granola bars every week depending on what I have in my pantry. They’re easy to customize so you can have fun swapping out the peanuts for your favorite nuts, dried fruit and even chocolate chips! They can even be gluten free depending on the oats and oat flour you use. 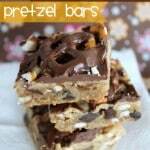 These bars make a fun and delicious snack that the entire family will love! 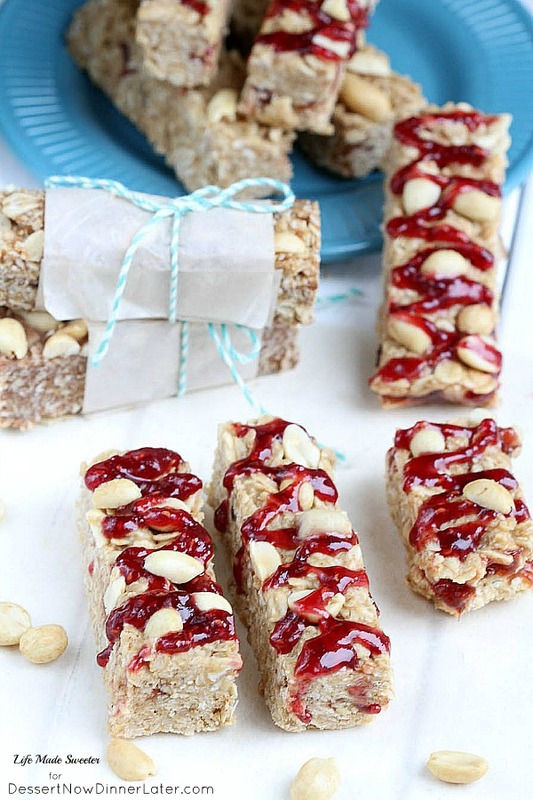 Soft, chewy no-bake granola bars that combine the classic flavors of peanut butter and strawberry jelly with crunchy peanuts. They contain no butter and can be gluten free if you use certified gluten free oats. Line an 8 or 9-inch square baking dish with parchment paper or foil sprayed with cooking spray. Set aside. Add peanut butter, honey, and coconut oil to a large pot over medium low to medium heat. Stir continuously with a spoon until smooth. Remove from heat and stir in vanilla extract, cinnamon and salt**. Add rolled oats, quick oats, oat flour, and flaxseeds; stir until combined. Press half of the oat mixture into the prepared baking dish. Spoon the jelly across the top of the oat mixture and spread evenly. Spoon in the remaining half of the oat mixture pressing down and flattening with a spatula or your hands. Sprinkle the tops with peanuts or chocolate chips if desired. Press down firmly so the nuts will stick to the surface. Refrigerate for 2 hours or until firm and set. 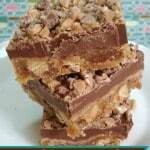 Remove from the fridge and cut into bars or squares. Store bars in the refrigerator, either in an airtight container with wax paper separating the layers, or individually wrapped in plastic wrap. For the jelly drizzle, scoop jelly into a small zip-top bag and cut off one corner. Pipe in desired pattern across granola bars (If jelly is too thick to pipe, microwave the amount you need in a small bowl for a few seconds first). Return to the fridge until jelly is set or enjoy immediately. 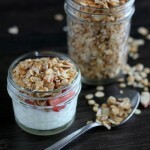 **For the oat flour, you can make your own by grinding up oats in your food processor. **Optional - add a tiny pinch of salt only if your peanut butter is unsalted. This balances out the sweetness from the honey and jelly. 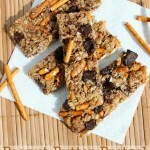 Granola Bars will keep up to one week in the fridge or up to two months in the freezer. They are best enjoyed straight from the fridge or let them sit out for a few minutes at room temperature. They will get softer the longer they sit out. You can substitute any chopped nuts, seeds, chocolate chips and/or dried fruit for the peanuts or add them additionally. Bars are best enjoyed straight from the fridge or chilled as they tend to soften up at room temperature. If you are leaving out the jelly filing, use ½ cup of honey instead of ⅓ cup. Love Kelly’s recipes! Can’t wait to give this a try. The sweet and salty combination is one of my favorites! Oh Kelly totally nailed it! Such a fun treat! I too love salty-sweet combos! Another fabulous recipe from Kelly!! 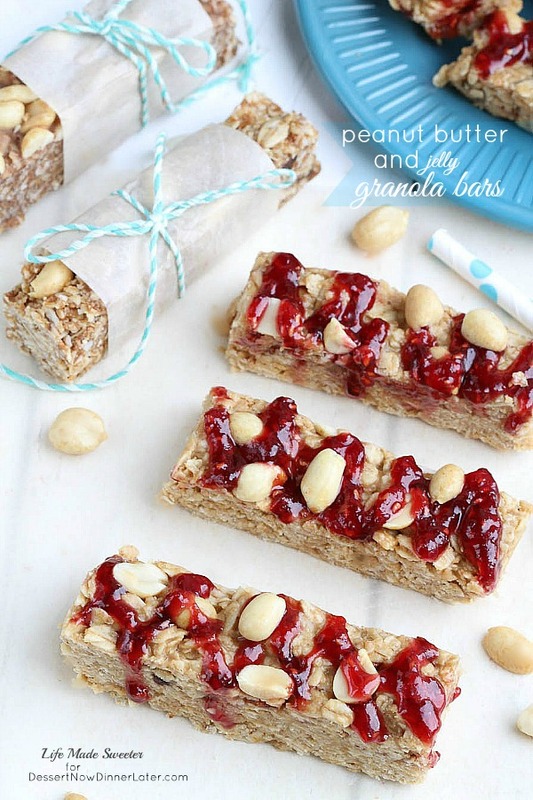 love that she made PB & J in a soft, chewy granola bar and YES to the ground flaxseed!! woot woot!! Kelly did an amazing job! Such gorgeous bars! Can’t wait to try them myself! Kelly does an amazing job at creating unique and tasty recipes, that’s for sure! LOVE these Kelly! Such an epic combination! Kelly is genius when she creates recipes! I too am in love with these granola bars! My son would love these! They will be great for his after school snack. I know my kids would devour these too! Kelly sure nailed this recipe! These are so fun, Kelly! They would be perfect for my grab and go breakfasts! I just made these. So yummy!!! I’m a huge pb&j fan so I knew this one would be a winner for me! SWOON! These are fabulous, Kelly! hi, can jelly be substituted by jam? what is pb&j pls?